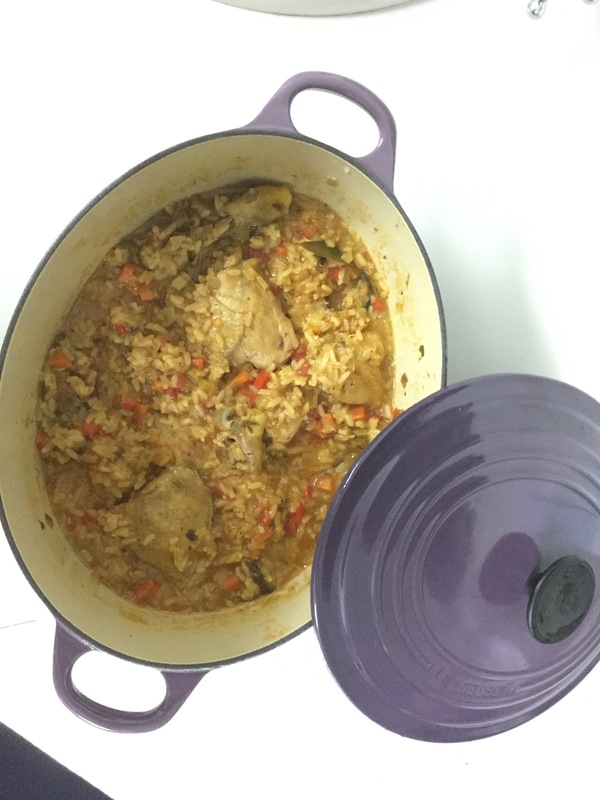 Chicken and rice cooked together in one pot makes for a heavenly meal. When entertaining it is the best dish to make as not much mess and a little goes a long way. The flavor from the chicken cooked with the rice and vegetables is only made better by the addition of white wine. 3/4 cup rice. I use long grain rice. 1. In a skillet heat the oil. 2. Add the onion and garlic and saute till glassy. Season the chicken with salt & pepper and brown both sides. 3. Pour over the wine and simmer for 5 minutes. 4. Add the rice, tomatoes, carrots, celery, peas and chicken stock. 5 Place bay leaves in the mixture. Bring to the simmer and lower the heat. 6. Cover and simmer gently for 35 minutes until the liquid is absorbed and the chicken and rice is cooked.